C’mon, you know what this game is. I really shouldn’t have to write anything about the first MK, since anyone reading this review likely knows every single thing about it already. It’s the one the news media demonized, moms feared, Senator Lieberman used to further his own political career, and people with level heads and an ounce of sense took as just another fighting game. I always respected Mortal Kombat for shamelessly capitalizing off its blatant gimmicks. (Watch the “Mortal Monday” release trailer. Suuuure you’re not marketing to kids… wink wink). However, it’s not that respectable of a fighting game. Even its designers admit that it was a quickie Midway job that was not intended to be superior to Street Fighter, (don’t take my word for it, watch the “Mortal Kombat History” DVD feature on the new Deadly Alliance game) and they are absolutely correct. 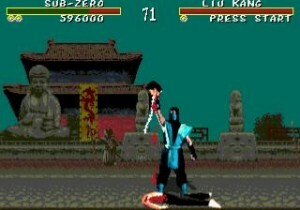 The only thing MK really has going for it is the blood and digitized characters. That got it through its release in 1992. It doesn’t hold up quite as well today. MK2 or Ultimate MK3 are better releases in my opinion, and if you have to grab one, you should pick from those two. A lot of things were done better in those later games, and they learned from the mistakes made in this one. But like me, you’re probably checking the first one out for nostalgia’s sake, so here’s the review. The first MK starts off the awkward story that the series so prides itself on. A group of fighters compete in an ancient martial arts tournament with the fate of the world hanging in the balance. Some are good, some are evil, most have their own agenda, which you see in story screens for each fighter if you win. The roster is much smaller than today’s gamers are probably used to, sporting only 7 kombatants: Sub-Zero, Scorpion, Sonya, Johnny Cage, Liu Kang, Rayden, and Kano. Each character also only has about 3 special moves, usually projectiles or magic. 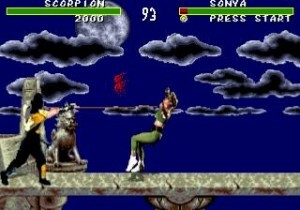 Unlike the SNES version, the blood and round-finishing fatalities that earned the series its infamy are still intact on the Genesis, though you will need to input a short code (ABACABB) at the first screen to “unlock” them. This is one of the earliest of the serious tourney fighters, so combos, counters, and proper balancing had yet to be considered or implemented. 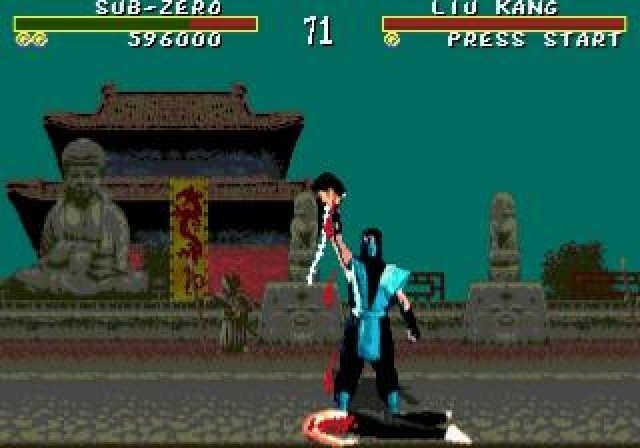 A lot of the special moves can be exploited, like Sub-Zero’s ability to almost always freeze you right as you get up from being knocked down. Also, constant high punches and leg sweeps can create an unbreakable offense. The AI is well-schooled in these cheap tactics and readily offers free lessons. At the other end, this is still the game where the bosses can be killed with only jumping kicks. Graphically, the game is impressive for the Genesis, despite being worlds away from the arcade. This is one of the first times that a game’s characters were taken from photos of real actors, and it shows. They’re low resolution, and a little blurry, and some even exhibit red outlines around them (like Kano), but it’s still believable enough to make it strongly compete against hand-drawn work. The animation is not overly fluid, especially in the backgrounds, but enough to get the job done. Fists and feet also land where they’re supposed to, instead of going through the other character, and the characters react properly to hits. It’s also neat to see the fighters automatically change their attacks based on the distance to their foe, such as Sub-Zero high punching at mid-distance and giving a strong backfist at close distance (or Kano’s headbutt under the same circumstances). These change-ups offer welcome variety and just look cool in the middle of battle. Sounds are a higher point. The background music is impressive, especially if you have a stereo setup. The effects are a little lacking though, and punches and kicks lack the power that you’d want. Projectile attacks usually give corny video game noises, and there’s little variety in pain noises. When you’re really putting someone in a hurt-lock, they’ll sound a lot like a broken record (or skipping CD, if you prefer). Controls work though, and the game gratefully supports a six-button setup. Attacks are easy to pull off, even the special ones, and having different buttons for high attacks and low attacks really is a good system. Even when you have to rotate down to toward, a fighting game staple, the game reads the movement as well as an arcade stick – which is great because many characters would suffer if it didn’t. Looks like he went head to head and lost. As said before, the over-hyped blood is here once unlocked. Powerful hits like the uppercut and head punches are the only things that start the red geysers flowing, and the amounts are greatly exaggerated – though this game actually has the least amount of bloodshed in the series. On paper it sounds violent and disturbing, which is probably what sent parents running, but on screen it looks extremely fake. If you’ve never played Mortal Kombat, don’t expect to be blown away by nauseating visuals – the emergency room shows on the Discovery Channel are far more graphic. Fatalities look even more cheesy, which they probably were always meant to, and it’s hard to watch them today and understand why they caused the controversy they did. 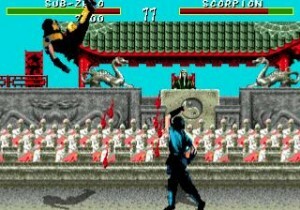 As far as gameplay goes, MK is pretty much a simple brawler. You can’t do much beyond mash buttons strategically, as there simply are no combos or linked moves in the series yet. The game does have the “test your might” minigame, where you press buttons to build up energy and then try to chop varying materials in half. I don’t understand why this was dropped in later versions, as it actually is one of the most enjoyable parts of the MK experience. It’s better than some of the fights at least. The mirror match and endurance modes (where you fight two fighters on one life bar) are also entertaining, and make the battle up the ladder more varied and challenging than just fighting all the characters until you hit the boss. However, aside from the nostalgia points, there’s not a lot going on here. Mortal Kombat can be fun, but it really is not a great fighting game, even less so when compared to fighters today, or later releases in its own series. Pick it up to relive the days of rebelling against the moral majority, master your favorite characters again, pull off the fatalities, but turn to a later MK if you’re looking for one to last. Good old MK: a classic fighter that’s fun to play again. No combos or strategy yet, everything here done much better in later games.